One of our most popular cosmetic treatments is teeth whitening. Teeth whitening is the process by which we remove stains, discoloration, spots, and darkness from your tooth enamel. The reason it is so popular is that teeth whitening can provide dramatic results in as little as one visit to our dental office. Dr. Laban Bontrager and Dr. Monica Bontrager offer two different methods of professional teeth whitening, in-office whitening and a whitening system at home. Our in-office whitening system, Zoom!, uses a whitening gel that is activated by a powerful light to lighten your tooth color by multiple shades in just 45 minutes. Zoom! whitening is the perfect choice for our busy patients or patients looking for a fast transformation. For those who like to have more control over their whitening experience, our dentists may suggest our at-home whitening system. We will provide you with custom trays that are made from molds and impressions of your smile, as well as tubes of our whitening gel. You will pipe the gel into the trays and wear them snugly over your teeth until they have reached their desired shade. If you are interested in a dazzling new smile, consider teeth whitening in Bristol, Florida. To learn more, we invite you to contact us at Bristol Dental Clinic today to schedule your teeth whitening consultation. 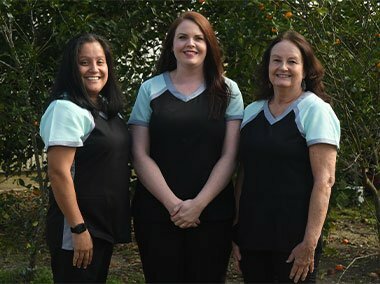 We are excited to help you achieve the smile of your dreams!